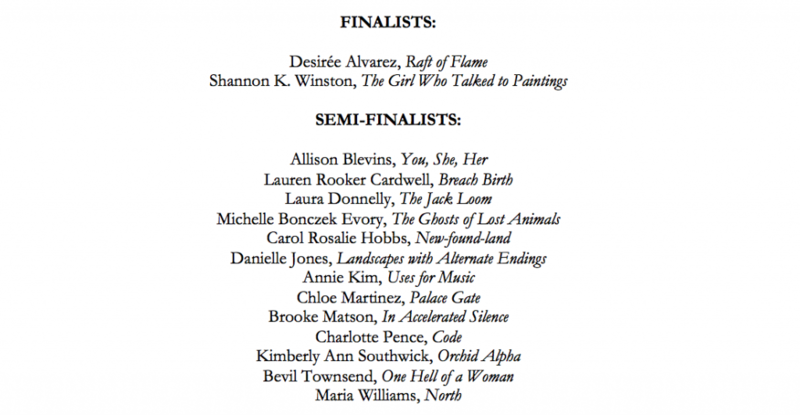 Since 1997, Perugia Press has been publishing first and second books of poetry by women. We publish one book a year, the winner of the Perugia Press Prize. Our mission is to help right gender inequity in publishing by launching women’s voices into the world, one excellent book at a time. Our goal is to produce beautiful books that interest long-time readers of poetry and welcome those new to poetry. We celebrate and promote our poets, and poetry, whenever we can, through social media, and at local, regional, and national book fairs, readings, and events. All Perugia poets are available for readings. Please contact the press to schedule an event. Perugia Press is a nonprofit organization with IRS 501(c)(3) tax exemption. & to the volunteers who helped read for & judge the contest! In the midst of the #MeToo movement, Peak’s book is timely and timeless in its confrontation of the constraints and concerns bound up in being a girl. 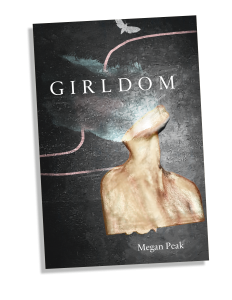 Megan Peak’s Girldom has won the 2018 John A. Robertson Award for Best First Book of Poetry from the Texas Institute of Letters! 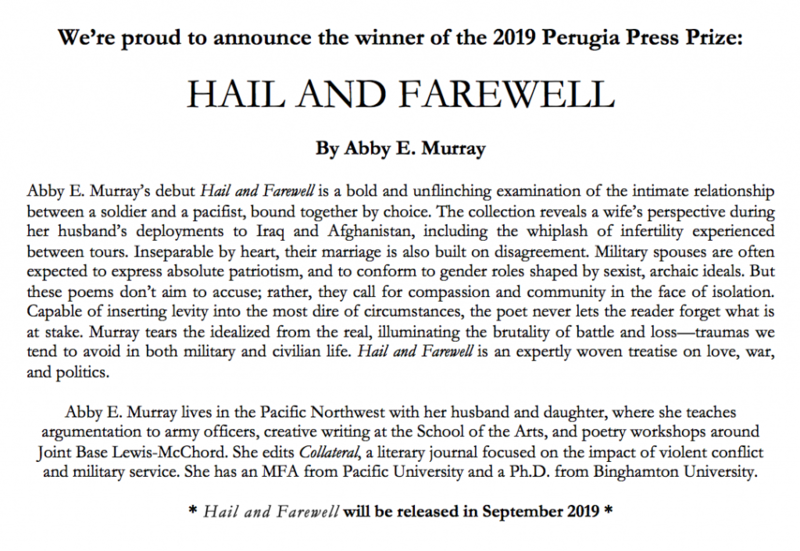 Abby E. Murray, author of 2019 Perugia Press Prize-winning Hail and Farewell, has been named 2019-2021 Tacoma Poet Laureate! Here’s a feature on Editor/Director Rebecca Hart Olander in the September 7, 2018 “Art Maker” column of the Daily Hampshire Gazette. She speaks about her own writing process and supporting her student writers and the women poets of Perugia Press. Here’s Emily Gwinn reading aloud 2009 Perugia Press Prize-winner Jennifer K. Sweeney’s poem “Weathering” for NPR Public Radio station Spokane Public Radio’s “Poetry Moment” on September 6, 2018. The poem comes from Sweeney’s Perugia collection How to Live on Bread and Music, which also won the 2009 James Laughlin Award for the Academy of American Poets. Here’s a wonderful interview Mariano Zaro conducted with 2007 Perugia Press Prize winner Lynne Thompson, published on August 19, 2018 on YouTube for Poetry.LA. Thompson reads her poem “To Blackness” from Beg No Pardon, which begins at 10:45 in this terrific piece (though we suggest listening to the whole piece to hear Thompson’s thoughts on ancestors, memory, music, coming to poetry after practicing law, hearing from founding editor Susan Kan on winning post-publication awards for Beg No Pardon, breaking stereotypes of “the other” in her poetry, the new projects she has cooking, and even Beyonce’s Lemonade!). Filmmaker Kate Way spent time with Perugia Press poets talking about the importance of women’s voices and poetry. Above is the 8-minute film she created from those conversations. The piece also includes scenes of a Perugia Press reading held at Smith College, and free writing workshops we offered to the community during our 20th anniversary celebrations in Northampton, MA. Enjoy!